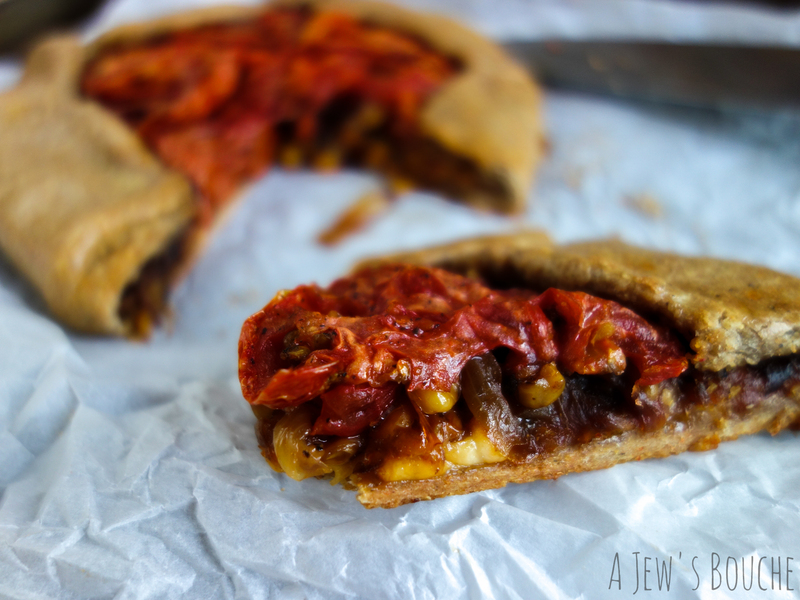 This post is part of a campaign that Jewhungry started in the food blogging community to raise awareness of poverty and hunger, in the process acknowledging our financial privilege and challenging us to create a nutritious dish for less than $5. She partnered with MAZON: A Jewish Response to Hunger to provide more information on how prevalent the hunger problem is and how to address it. Food insecurity is a the technical term referring to the USDA’s measure of “a household-level economic and social condition of limited or uncertain access to [nutritionally] adequate food. Hunger is an individual-level physiological condition that may result from food insecurity.” Food insecure households are not necessarily food insecure all the time. So how big is the problem? 1 in 7 Americans struggle with hunger, including 15.3 million children and 5.4 million seniors. Beyond income poverty and food insecurity, as you’ll see below, my recipe required a lot of cooking time. This made me think more about income poverty, and made me more mindful (as busy as I am) of my time privilege. Although the combination of time poverty and income poverty is relatively rare for adults of working age, children are concentrated in these households. Often escaping income poverty comes only by incurring time poverty, or vice versa. This campaign reminded me of a project I read about a couple of years ago started by Leanne Brown. While completing a Master’s degree on Food Policy, Ms. Brown sought to find a solution to the problem of eating well on the $4 per day allocated by the SNAP (aka food stamps) program. The result is the cookbook Good and Cheap: Eat Well on $4/Day. The second, expanded edition is out now, and for each copy bought, another copy is donated to someone in need. You can read a sampling of recipes from the book in this PDF. My approach was to the challenge was to use simple, cheap, but nutritious ingredients and bring out the intense flavors they have the potential to develop. I knew that a galette (a rustic, free-form, sweet or savory filled, flaky crusted tart) would be the best vehicle to showcase these flavors in a cheap but hearty way. I bought the cheapest tomatoes and onions I could find, along with a can of corn on sale. I also used other staples at hand that I had bought on sale. My accounting for the dish, not including the minimal quantities of salt, pepper, and garlic powder, totals $4.94, coming in just under the $5 threshold. Roasting is my favorite way to develop and concentrate flavors in vegetables. 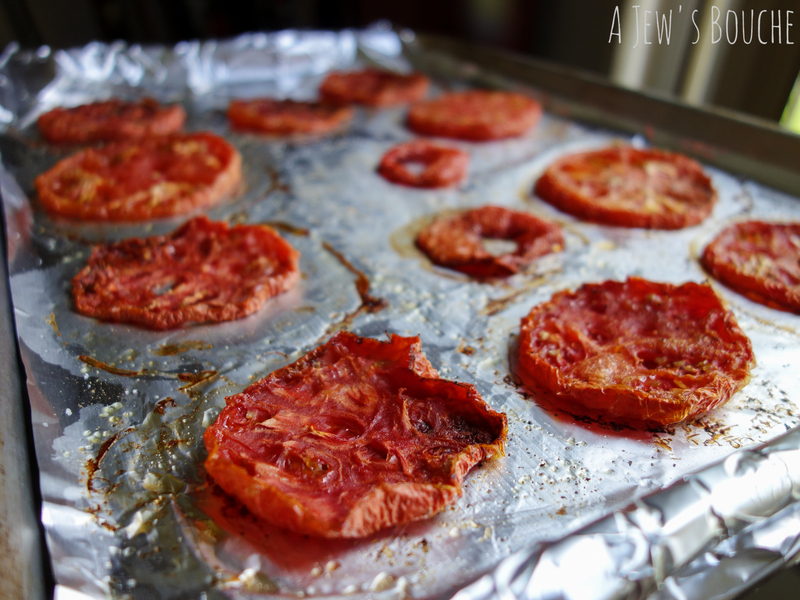 Slow roasting is even better, so I sliced up the tomatoes, drizzled with canola oil, sprinkled with salt and pepper, and roasted as low as my oven would go (around 230°F) for three hours, flipping once halfway through. I tasted one when they were done and was blown away at how rich and intense the flavor was. It was like a simmered-all-day marinara. If I had a bigger budget, I probably would have used olive oil and thyme, but the truth is, it comes out amazing as it is. Talk about transforming cheap ingredients! 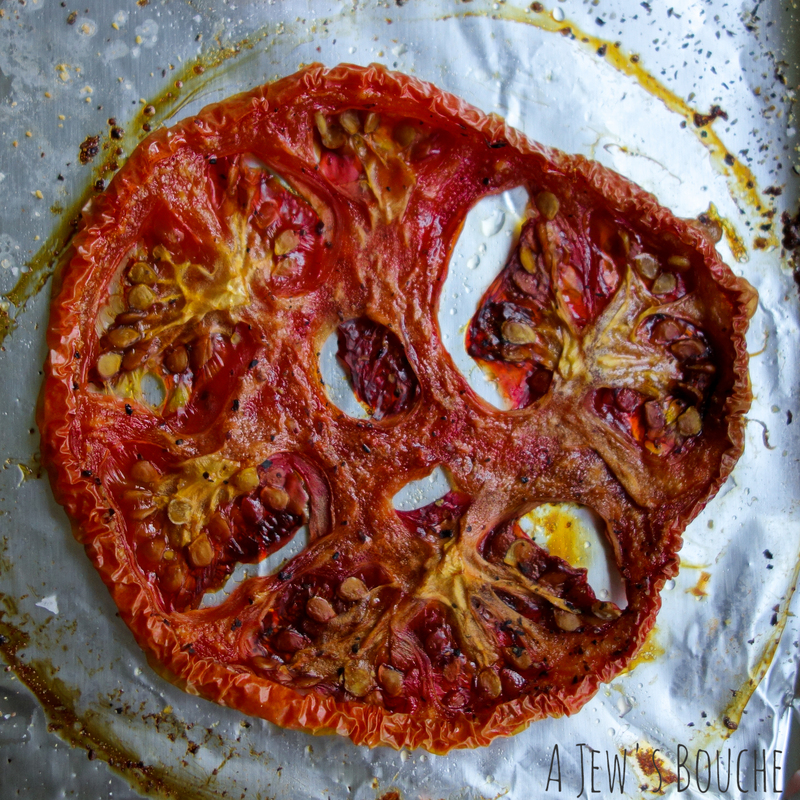 You can see the outline the raw tomato slice left surrounding the roasted slice. It shrinks down as moisture escapes. Less moisture = chewier texture and concentrated flavor (not to mention the new flavors born during caramelization)! While the tomatoes were roasting, I opened the can of corn and drained it in a strainer, reserving the flavorful liquid to use later in my dough. I sliced the onions longitudinally (vertically) to maximize sweetness when caramelized. This avoids cutting across, which would rupture more cells and release more bitter compounds. I threw the onions in a skillet over low heat along with sliced scallions, canola oil, and salt, stirring every so often and more frequently toward the end of cooking. This process also requires patience, but rewards you with deeply sweet and savory caramelized onions. When the onions were almost finished cooking, I threw in the corn and turned up the heat. This part’s a little tricky, and I suppose I could have taken a better approach. The goal is to start to brown and blister the corn (which necessitates leaving them alone to prolong contact with the hot pan) while not burning the onions (which necessitates moving them around). 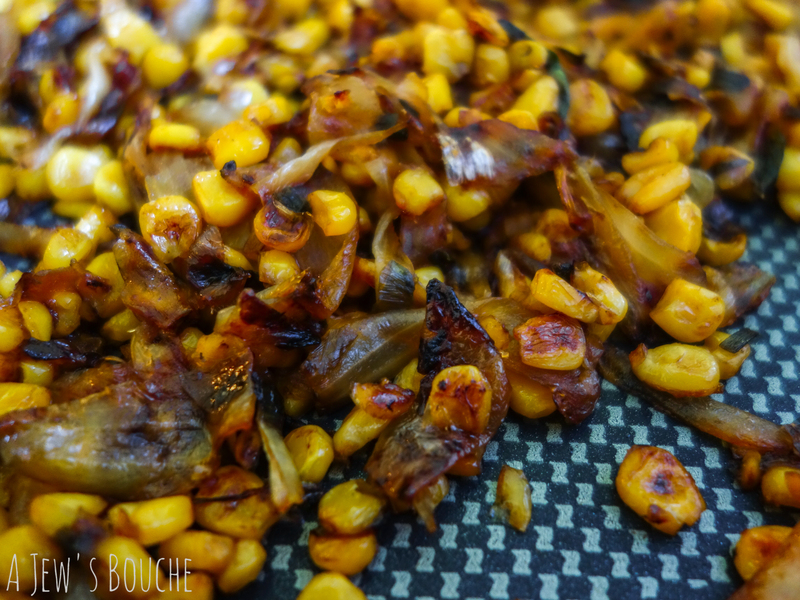 I stopped the cooking before the onions burned, at the expense of better caramelized corn, but I think I did pretty well overall. See for yourself. Next up, the dough. Years ago I realized that I can make my own pie or quiche shells cheaply and more healthfully than buying the expensive and preservative-laden pre-made ones from the store. I don’t have a recipe per se, I just combine flour, salt, water, oil, and other seasonings, adding a little of this and a little more of that until it seems right. To make the crust more nutritious for this dish, I used a 2:1 blend of whole wheat and regular flour (ideally all purpose flour, but I was out of it, so I used bread flour; the higher gluten content doesn’t really affect the final texture). Making your own dough is also another opportunity to add flavor. I love to add seasoning to my dough to match or complement the final dish. In this case, I substituted the reserved liquid (about half a cup) from the canned corn for some of the water in the dough, and I included garlic powder and a heavy dose of black pepper in the seasoning along with the salt. To finish it off, roll out flat, sprinkle cheese the cheese in the center leaving a border around the perimeter (you can also leave the cheese out for a parve/vegan dish), spread out the caramelized onion and corn, layer the roasted tomato slices, and fold the uncovered dough border over toward the center. Brush the dough with a beaten egg. Bake at 350°F for about 30-40 minutes and dig in! You’ll find it intensely savory with rich, deep flavors and a nice crispy, tender crust. If there are any leftovers, it’s even better the next day. SO delicious!!! I love this recipe! This looks absolutely delicious! So great to have found you through #foodiesfightinghunger, can’t wait to check out your site! I feel the same! I’m so glad to discover you and the other bloggers. Thanks so much for joining us, we appreciate your support. 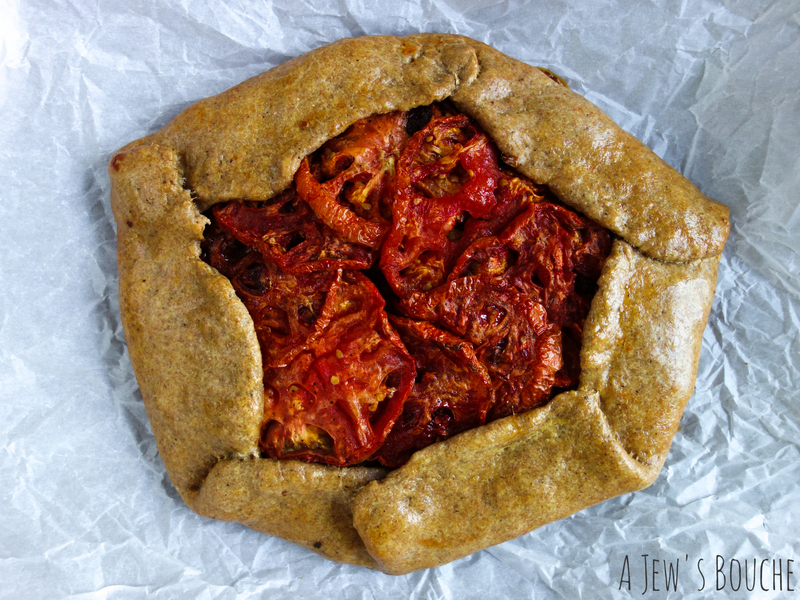 This galette is STUNNING!